Shape: Rectangle, Triangular, Square etc. Clamshell Containers for Fast food items like Burger, Donuts and others. These Crystal clear containers add to the appeal of the food items packed in it. 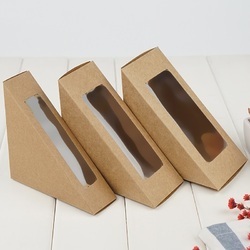 Being a renowned enterprises in this industry, offering an optimum quality assortment of Sandwich Packaging Box to our customers. These products are used in various food shops. - Hinged cover makes it easy to open with one hand. - Fits properly into backpacks, briefcases and purses. - Holds sandwich or average size of snacks. 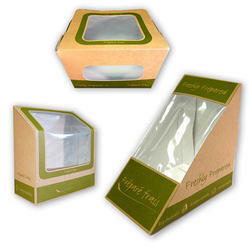 Our clients can avail from us a wide range of sandwich keeper, which is at par with the international quality standards. Our vendors develop and design these in two color combinations and various sizes to suit the requirements of our esteemed clients. Moreover, these are offered at industry leading prices in the market.